From onstage leaps, to emotional musical performances, the Oscars brought out all the stops. 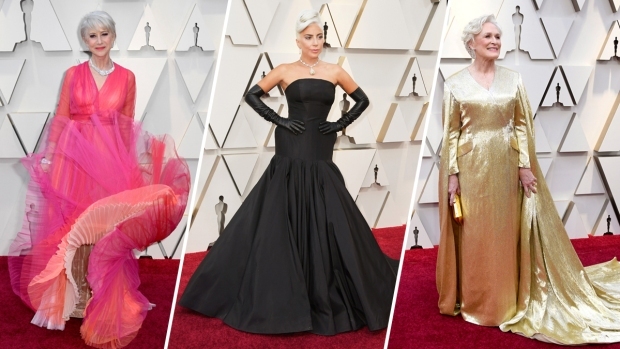 Lady Gaga offered a heartfelt message to those watching the Oscars after "Shallow" from the film "A Star Is Born" won an Academy Award for best original song. "If you are at home and you are sitting on your couch and you are watching this right now, all I have to say is this is hard work," said Gaga, who co-wrote the song with Mark Ronson, Anthony Rossomando and Andrew Wyatt. Gaga effusively thanked the academy and her co-winners, as well her sister. She also singled out for praise her co-star Bradley Cooper, who performed the song with her at the 91st annual awards at the Dolby Theatre in Los Angeles. The song won two Grammy Awards earlier this month. It also received original song honors from the Golden Globes to Critics Choice Awards. "It's not about winning," Gaga continued. "What it is about is not giving up. If you have a dream, fight for it. If there is a discipline, or passion, it's not how many times you get rejected or you fall down or are beaten up. It's about how many times you stand up and are brave and keep on going." After Gaga's speech, Ronson paid homage to the Grammy-winning singer. Both collaborated on Gaga's 2016 album "Joanne," a rock-pop-country adventure that was a departure from the dance-flavored electronic sound that made her a multiplatinum juggernaut. "She acts, she sings, she writes," he said. "Lady Gaga we salute you." "Shallow" has become a radio hit, peaking at No. 5 on Billboard's Hot 100 chart and scoring four Grammy nominations. The soundtrack, featuring songs co-written by Bradley Cooper as well as Gaga, is platinum and debuted at No. 1 on the charts. The song's performance during the show seemed to catch attendees by surprise. One moment Cooper and Gaga were in their seats, the next they simply stood up, walked on the stage and gave an intimate rendition of the song, sitting together at the piano and singing into a single microphone during the final chorus. The audience erupted into a huge ovation, then gave Cooper and Gaga another one when they walked back to their seats the way they came during the commercial break. The two stars shared a hearty hug after the cameras cut away when they finished the song. In another music category, "Black Panther" composer Ludwig Goransson won for best original score. He talked about how far he and director Ryan Coogler have come since they both attended college together at the University of Southern California School of Cinematic Arts. "Working with you has been an incredible honor," said Goransson, a longtime producer of Childish Gambino. "I know 12 years ago, we were sitting in our dorm at USC writing the score for your first short film. And we're here 12 years later celebrating one of the most important cinematic moments in history. I want to share this award with all the incredible African-American artists that I worked with on this score."